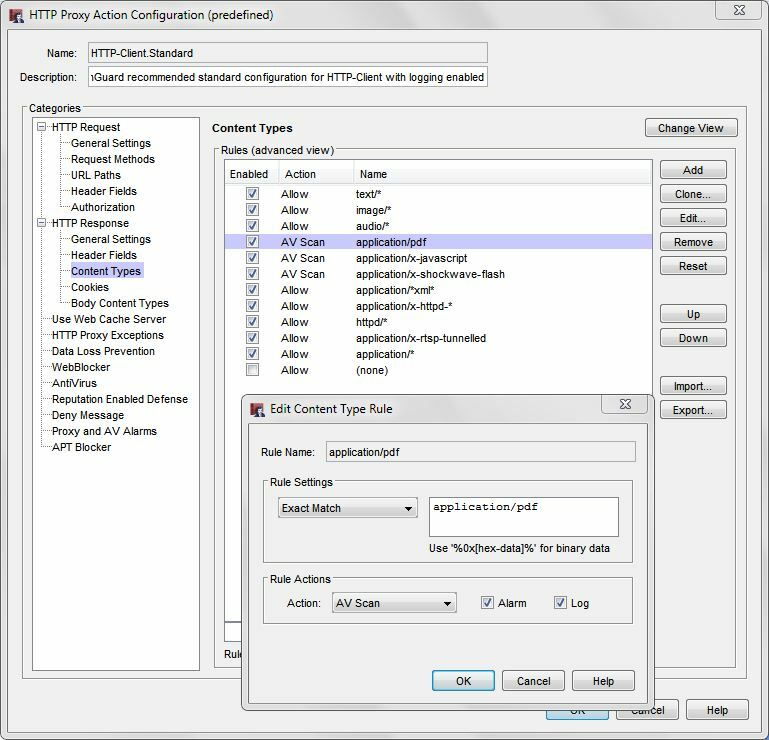 Enable IPS on all outbound policies, especially the default „Outgoing“ policy. Make sure your IPS signatures are up to date. IPS signatures are always changing to keep up with new threats, and you can enable automatic signature updates so that you always have the latest version of signatures. You can search and view the current WatchGuard threat database at http://www.watchguard.com/SecurityPortal/ThreatDB.aspx. In some high security environments you may want to use a more aggressive action for „Critical“ and „High“ threat levels, and set them to „Block“. 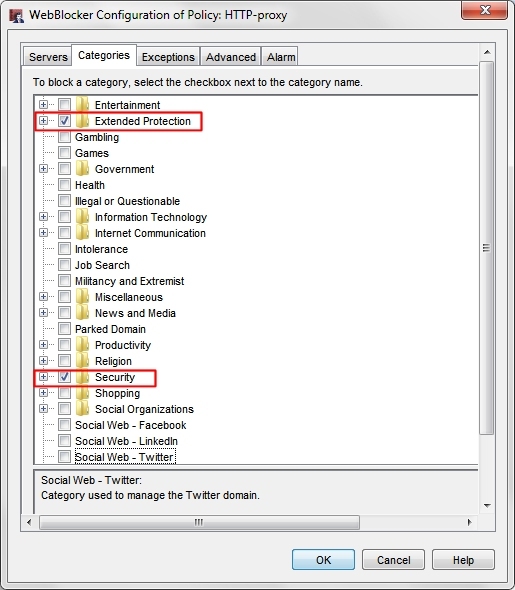 The „Block“ action will add the source of the IPS intrusion to the Blocked Sites List for 20 minutes. 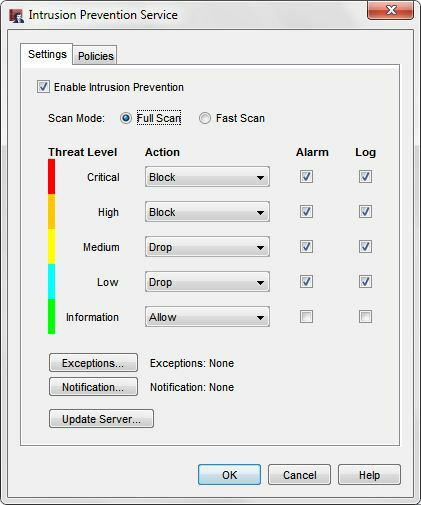 Select the Alarm and Log options for each threat level so that you receive email notifications in the event a malware threat is detected. There are 2 different scan modes you can choose from „Full Scan“ or „Fast Scan“. Full Scan — Scan all packets for policies that have IPS enabled. Fast Scan — Scan fewer packets to improve performance. This option greatly improves the throughput for scanned traffic, but does not provide the comprehensive coverage of Full Scan mode. This is the default setting. Beginning in Fireware OS v11.8, „Fast Scan“ is the default scan mode for IPS. In environments with high value data, you can switch to „Full Scan“. Performance will be affected when you use the “Full Scan” option. 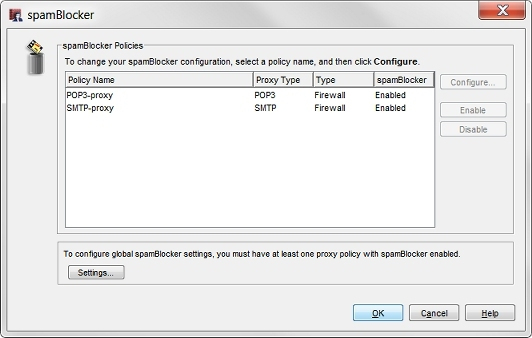 Enable Application Control on all outgoing policies including the default „Outgoing“ policy. 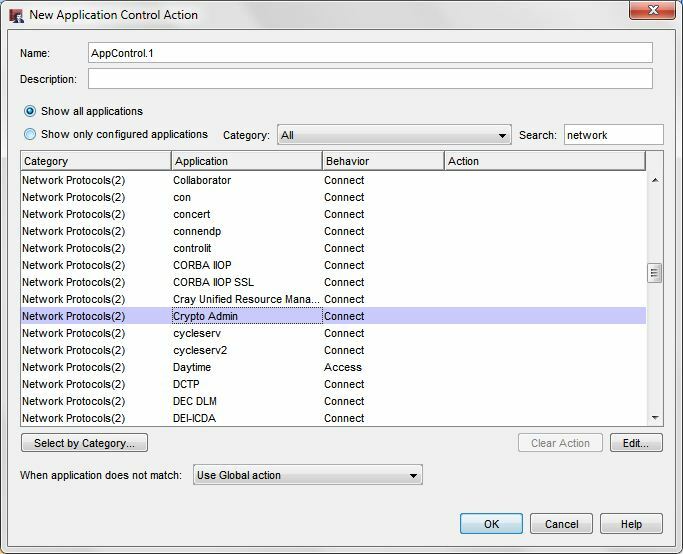 Application Control has a “Crypto Admin” application as part of the Network Protocols category to detect CryptoWall, CryptoLocker, and their variants. Make sure the action for this application is set to „Drop“. 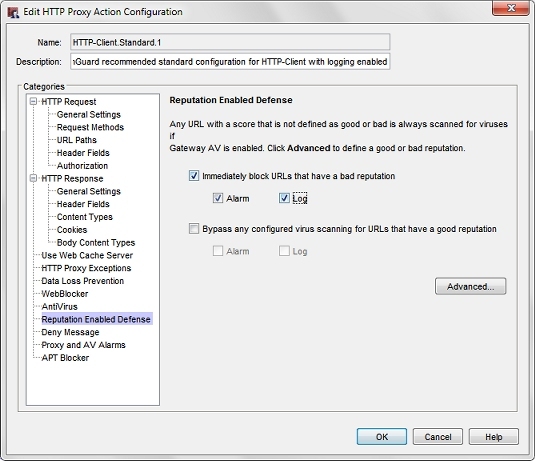 Enable WebBlocker on your HTTP and HTTPS proxy policies to protect your web traffic. Use the Websense cloud service that contains 130 security categories. 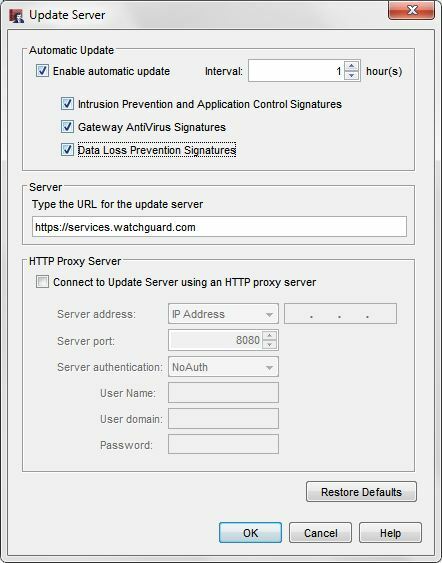 Enable Gateway AntiVirus on your HTTP, FTP, SMTP, POP3, TCP-UDP proxy policies. Make sure your Gateway AntiVirus signatures are up to date. Enable automatic signature updates so that you always have the latest version of signatures. In the global Gateway AntiVirus settings, select the Enable Decompression option to scan inside compressed files such as .zip archives. In the HTTP Response > Body Content Types proxy action settings for Gateway AntiVirus, make sure you set the action to Deny or AV Scan for .exe files. For each proxy, we recommend you add similar file types that can contain malware such as scripts, Windows system files, and office application macros. Note: Smaller WatchGuard devices with less memory resources use a subset of the Gateway AntiVirus signatures. In high risk environments, we recommend you deploy Firebox devices with more resources to get the larger signature set. Use Reputation Enabled Defense on your HTTP-proxy policies to block access to URLs with poor reputations. Enable the Alarm and Log options for notifications and for logging and reports. APT Blocker uses cloud-based scanning of files to detect zero-day malware. 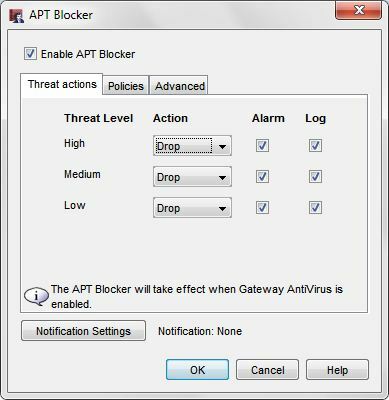 The APT Blocker subscription service is an add-on subscription service and is not included in the standard security subscription suite on your Firebox. 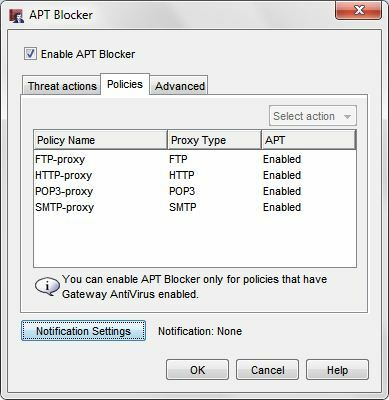 Enable APT Blocker on your HTTP, FTP, SMTP, and POP3 proxy policies. Enable the Alarm and Log options to immediately notify you by email when APT malware is detected and log the event for reports. Enable spamBlocker on your SMTP and POP3 proxies. Use the Dimension dashboard, logs, and reports to monitor for malware activity. 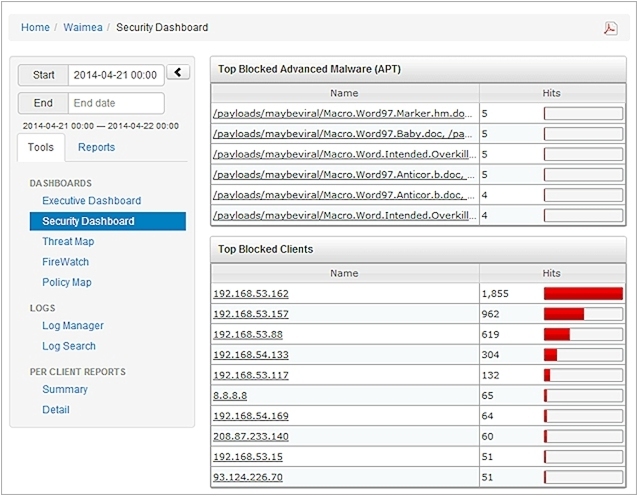 The Security Dashboard provides an overview of blocked malware. Thanks for the information, very well done.